Yesterday, Simpsons executive producer James L. Brooks announced that the show’s 1991 episode “Stark Raving Dad” will be pulled from circulation because of its association with Michael Jackson. You won’t be able to watch it in syndicated reruns, or on the Simpsons streaming app, or on future DVD releases. Unless you already have it on a Simpsons DVD, recorded on an old VHS, or you seek it out through illegal means, it will essentially not exist. I understand the impulse, especially given the tenor of the episode and the Jackson-focused nature of it. 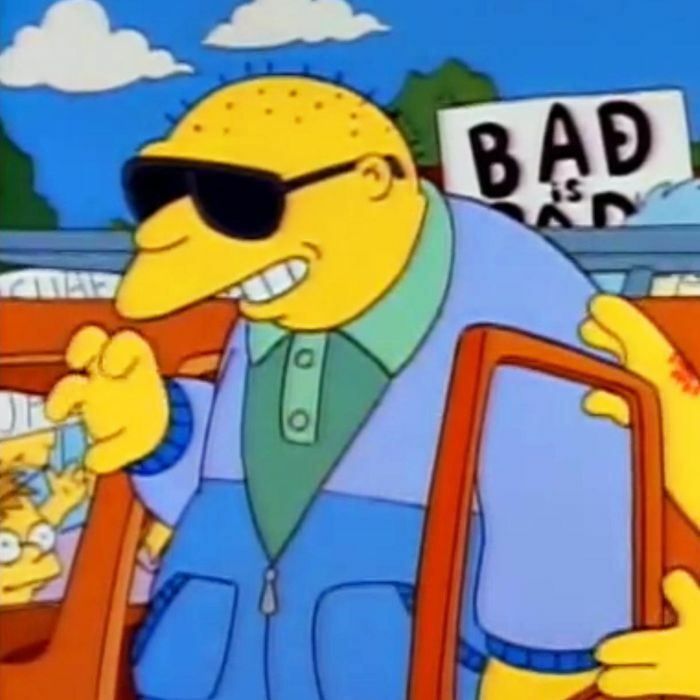 But the loss of “Stark Raving Dad” makes me sad, not just because it’s a great episode of The Simpsons, one that’s funny and genuinely touching, but also because it’s especially interesting to watch in light of Leaving Neverland. In “Stark Raving Dad,” the season-three premiere that originally aired on September 19, 1991, Homer gets called out for wearing a pink shirt to work at the power plant instead of the standard white. Singled out as potentially mentally unstable because of this choice, Homer is given a written test to prove he’s sane. In his laziness, he hands it off to Bart to complete, which is why he ends up at the New Bedlam Rest Home for the Emotionally Interesting, a.k.a. Springfield’s local mental hospital. That’s where he meets Michael Jackson, or, rather, a large white man with tiny porcupine spires for hair who identifies as and sounds exactly like Michael Jackson. Jackson actually provides the speaking voice for the character, though at the time, he wasn’t officially identified as a guest actor. He was instead credited as “John Jay Smith,” and according to the DVD commentary track, the character’s singing parts were largely farmed out to Kipp Lennon at Jackson’s insistence as a prank he wanted to play on his brothers. The main theme of the episode — that when a person makes an unconventional choice, they are dubbed crazy — feels very much in line with the Jackson narrative at the time, even though he didn’t technically have a role in writing the episode. (He did make several suggestions though, including the idea that Michael would help Bart write a song.) In 1991, Jackson was still two years away from facing accusations of child molestation, but he was definitely being called “Wacko Jacko,” and the episode certainly can be read as a response to that. Watching the episode today, there are definitely some things that come across as creepy or problematic in retrospect. The fact that “Michael” is cast as a victim is one of those things; so is the fact that as soon as “Michael” arrives to stay with the Simpsons, he immediately centers his attention on Bart and Lisa, ultimately helping Bart write a birthday song for his lonely sister. (Especially one lyric in particular: After Bart sings, “I wish you better than your heart desires,” Michael jumps in with, “And your first kiss from a boy.”) There are also a couple of moments where we see Dr. Hibbert, the family pediatrician blatantly inspired by Bill Cosby’s Cliff Huxtable, celebrating Jackson’s arrival in Springfield. Which is a trip. But what’s most fascinating about the episode is that Michael Jackson isn’t really playing Michael Jackson. At the end of the episode, the “big, fat, white mental patient,” as Bart calls him, admits that he’s actually a bricklayer named Leon Kompowsky and reverts to his gravelly, vaguely New York–ishly accented voice provided by Simpsons regular Hank Azaria. In other words, this imposing, unhappy man seemed kind of scary until he started convincing himself and others that he was Michael Jackson. Because who could be afraid of Michael Jackson? And wouldn’t the world be a better place if everyone could be like him? The way that “Stark Raving Dad” so casually accepts that as truth is a reflection of how Jackson was regarded at that point. He was considered a gentle man and an odd one, for sure, but still a hero and an icon. The episode highlights that reputation in a way that perhaps doesn’t come across as persuasively as hearing people describe what a highly regarded, almost Christlike figure he was. But in “Stark Raving Dad,” you can still see and feel how ingrained Jackson admiration was in American culture. That feels like an important part of the history of Jackson’s public narrative, at least to me. There’s also something both disturbing and heartbreaking, in hindsight, about Michael Jackson being disguised inside a white man. By 1991, Jackson’s vitiligo was turning his skin paler and his facial features were being manipulated more and more by surgery. He was already ceasing to look like himself. In a way, even if that’s not what this episode means to convey, Jackson already was walking around in disguise. Watching “Stark Raving Dad” now, you think, Wow, it’s crazy that he was able to do that. And you also think, It’s crazy that we believed it. An episode about one man’s denial of his own identity, vis-à-vis Michael Jackson, allows us now to think about the real Michael Jackson, his alleged crimes, and the depth of his own denial. This otherwise gentle Simpsons episode now has layers of meaning unwittingly embedded in it, layers that will be hidden away as this fascinating half-hour of television is shelved, perhaps forever. Brooks is right that the Simpsons producers are allowed to take out a chapter of their own book. And I understand why. But again, it makes me sad. That chapter seems like an important part of Simpsons and Michael Jackson history that’s worth reexamining with the benefit of what we now know.